Central serous chorioretinopathy is a retinal disorder which affects the macula. It was first described in ophthalmology more than one hundred years ago. Essentially, it is an "idiopathic disorder" which means that the precise cause is unknown. Central serous is associated with an elevation (detachment) of the macula due to leakage of fluid from the circulation behind it (choroidal circulation). Although the precise pathophysiologic events leading to macular detachment are still poorly understood, the clinical manifestations begin with a disturbance in the retinal pigment epithelium which alters its normally impermeable state so that fluid leakage occurs, producing detachment of the retina itself. In this regard, the retina appears to be affected only secondarily. It is currently believed, according to research by our group, that the choroidal circulation develops a pool of extracellar fluid or edema. 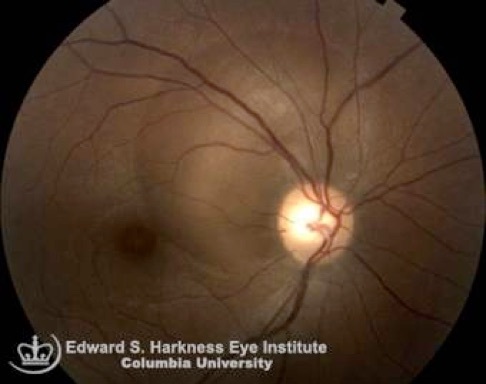 This intrachoroidal edema or leakage exerts pressure on the pigment epithelium, causing it to blister-up into focal or multifocal elevations known as serous detachments of the pigment epithelium. The blister disrupts or develops a mechanical opening, usually at the junction between its elevated and attached areas, permitting fluid to leak through the pigment epithelium beneath the neurosensory retina. This leakage is called "avascular" since it is not associated with the proliferation of an abnormal blood vessels (neovascularization) as is typical in the wet form of age-related macular degeneration. 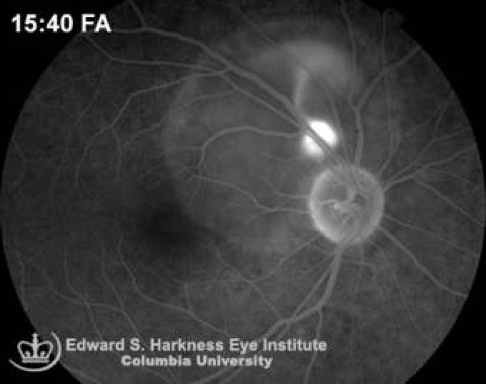 It is important to keep in mind that neovascularization may occur even in a patient with central serous chorioretinopathy as a secondary complication. 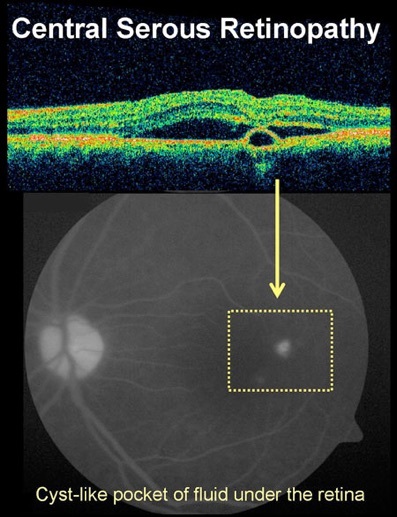 So, while central serous chorioretinopathy is associated typically with non-vascular leakage, vascular leakage may evolve. One of the challenges in diagnosing central serous is distinguishing between these two types of leakage, especially in middle-age and older-age patients who are at risk for both central serous and age-related macular degeneration. The leakage occurs through a defect in the tissue layer known as the retinal pigment epithelium. The retinal pigment epithelium is a single-celled layer that lies between the retina and the choroid. 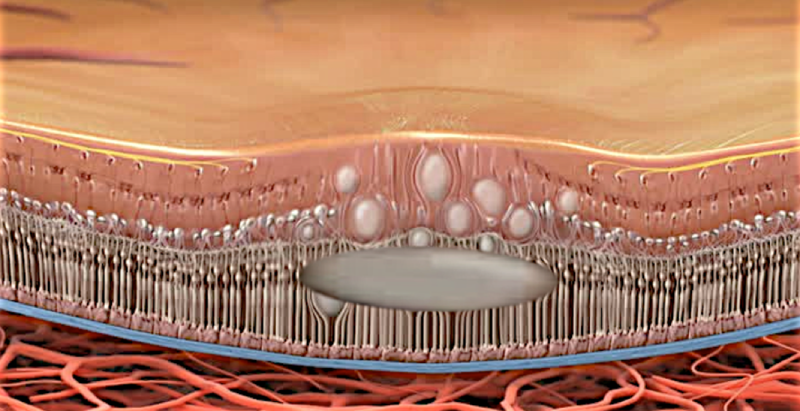 This tissue layer normally serves to prevent fluid from the choroidal circulation from leaking under the retina. In central serous, fluid equilibrium is disturbed leading to leakage beneath the retina which elevates it to produce a macular detachment which distorts vision.